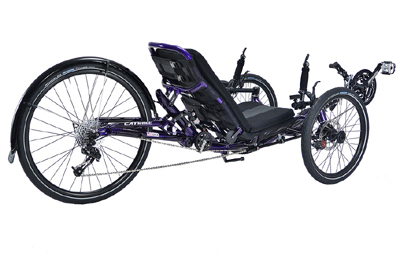 The Catrike Road-AR is our best priced full-suspension trike, with an excellent parts group. Sport-casual with a suspension system made for stability. 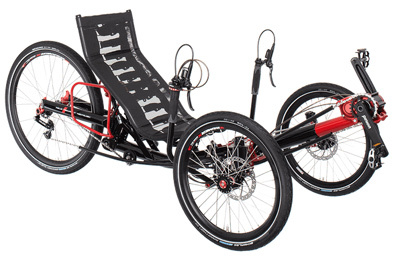 The 3rd edition Catrike Road-AR has an adjustable seat seat recline between 38 and 45°. 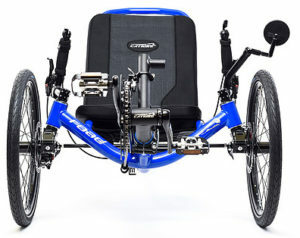 It features front and rear suspension for extra comfort and stability at speed using a sophisticated compressed air shock absorber to the rear and Catrike’s roadway specific anti-dive front suspension. New for 2017, the Road-AR adds a new level of comfort with its adjustable padded seat. If you aren’t looking for the highest speeds but you want the comfort of a moderate recline and a plush, suspended ride, then give this model a look. As usual for Catrike, the comparison of parts quality to price is outstanding. The RockShox Monarch R suspension offer both precise stiffness adjustment and easily adjustable rebound control. While it doesn’t fold like a suspended ICE or AZUB trike, or the Catrike Dumont, it is our lowest priced fully-suspended trike and it comes standard with the finest and most tunable type of suspension, a RockShox Monarch compressed air shock. This is a pricey upgrade on an AZUB and isn’t available at all on an ICE. We’ve classified the Road-AR as a “casual” trike, but it is a bit on the sporty side for that. All Catrikes lean to the sporty side, so we’ve had to bend our conception of easy going to fit it in. The Road-AR is a vibrant and efficient machine. A progressive linkage air shock and CNC swing arm provide a highly adjustable suspension platform paired with the new patent pending front suspension to take the edge off the road for a smooth ride. An optimized cockpit design is supportive enough for a comfortable daily ride, commute or weekend adventure without sacrificing any control or performance. Lean into the corners with confidence. The Road-AR brings excitement to the journey. Who fits on it, where it fits. how wide of a door you can get it through, but we can show you how to finagle it through a narrower one. This is how you know if you'll fit the trike. See our discussion here. If you are in the top 2" you'll need an XL boom for an extra $25. All good quality but not fancy. wide range, smooth action, with a special doo-hickey that makes rear wheel removal easier. Padded Seat - Cushion sticks on to the seat mesh for extra comfort. Ergonomic adjustable seat back - choose a recline angle that's right for you. Rear Fender - Keeps the mud off your back. This isn't about riding in the rain, this is about riding after the rain. Mirrycle Rear View Mirror - A quality bicycle mirror, left side. Comes with free mirror mount that serves as a good place to mount a cycling computer as well. Multi Purpose Clipless Pedals - So many brands don't even supply pedals with their trikes. Catrike gives you a good pair. You will want some kind of foot retention on a trike. Locking Brake Levers for Parking - Both brake levers have a button that locks the lever down so your trike won't roll away. No Brake Steer - Well, kinda. You can brake fairly hard on just one front wheel without fishtailing. Don't push it. Self Centering - You can pick your nose using both hands and your trike won't drive off the road. Ackerman Steering Compensation - Their way of saying their trikes handle real nice. Structural Front Boom - The boom is the nose of the frame, up where the pedals are. It is subject to flex under pedaling force, but Catrike adds internal structure to the boom to resist this. Quick-Release Indexing Boom Clamp - Makes leg length adjustment easier. Aluminium Rod Ends - The steering rod has ball joints on its ends, and those are made of aluminum to save weight. Low Friction PTFE Flared Chain Tube - The chain runs through some tubes to protect the frame and your pants, and that tube is slick to resist friction.